Saturday extended from Acton to Kew Green to replace withdrawn 265. RTL allocation replaced by RM. Mon-Fri service withdrawn between Bloomsbury and London Bridge - this section replaced by new Red Arrow route 501. Also withdrawn between Tottenham Ct Road Stn and Bloomsbury off peak but extended evenings from Oxford Circus to TCRS. Saturday am withdrawn between Oxford Circus to London Bridge with no replacement service. Middle Row garage closed - allocation transferred to Westbourne Park. Mon-Sat withdrawn between Wormwood Scrubs and Acton and extended from Oxford Circus to Bloomsbury at all times. Mon-Sat extended from Wormwood Scrubs to East Acton. Sunday withdrawn between Kew Green & Richmond. Sunday Route converted to midibus operation and transferred to Alperton Garage. Mon-Sat extended from Bloomsbury to Russell Square. This was part of a number of changes in Central London for this date. Extended from Oxford Circus to Russell Square at all times. Alperton allocation withdrawn in favour of a reinstated Westbourne Park allocation. Mon-Sat evenings converted to midibus operation. Sunday allocation transferred to Acton (AT) and converted to double deck. Sunday Westbourne Park allocation re-introduced. 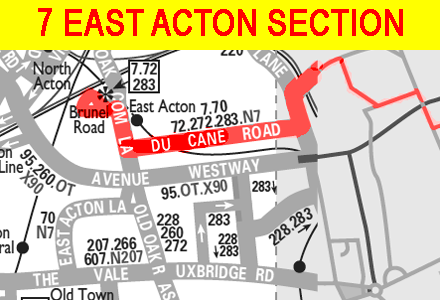 Extended in East Acton to Brunel Road. Sunday Acton (AT) withdrawn. New schedule introduced to aid reliability. Contract reassigned to Metroline operating from the Perivale (PV) garage using TP type until new East Lancs Olympus type are delivered. First loaned Tridents until the new vehicles were delivered but these were used on Route 297. Gradual conversion commenced of new East Lancs Scania type. Withdrawn between Oxford Circus and Russell Square officially. Garage journeys leave line of route at Cambridge Gardens and observe Route 52 stops to Kensal Road. Buses pick up and set down at garage. "Display NORTH KENSINGTON Middle Row"
Changeover point at garage all buses running light from East Acton via Western Avenue and Ealing Road. Changeover point not known - at garage running dead from East Acton ? ?